I am trying to finish up quilts that I have committed to make. I gathered up the fabrics for this little baby from our donated fabric at church. I finally got around to working on it almost 2 weeks ago. It has taken longer that I thought it would but I finally finished it today. It measures 36 x 36; this is my new favorite size for a baby quilt made for our Caring Closet at church. It is not too big to cover a baby in a car seat or stroller and big enough to lay on any surface for the baby to lay on. 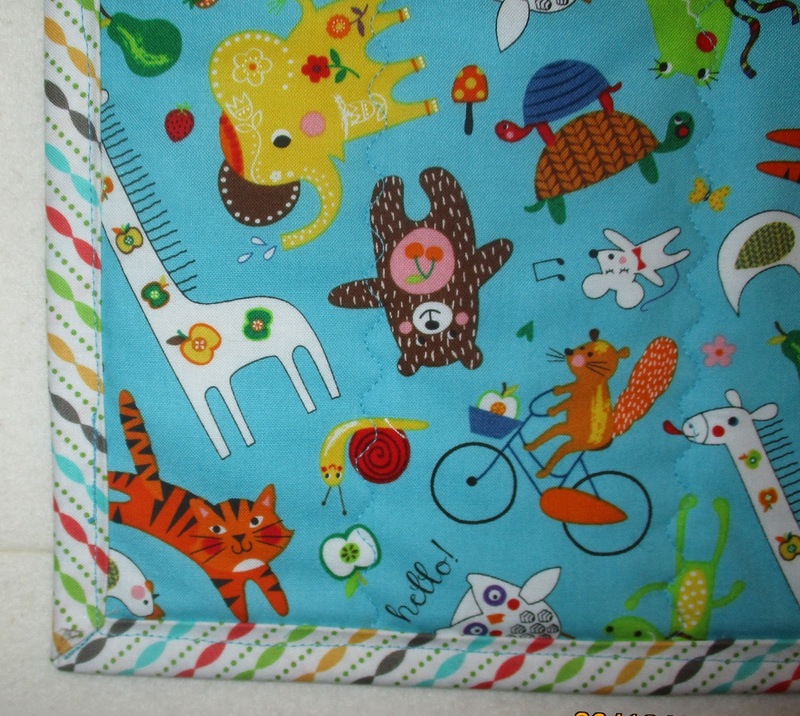 It is also a good size for a toddler to drag around should it become a favorite "blankey". The fabric is definitely girly fabric there are pink things and girly words on the fabric. The pinwheels and the motif squares are 4 inches. I meant for the large center square o finish at 12 inches but I cut one side wrong, hence the frame around the center square. A closeup of the center square and some of the 4 inch motif squares. I quilted in the ditch around all the pinwheels and 4 inch squares and across the diagonal in two directions. All the little motifs in the center block had dotted lines around them and I quilted just out side those lines to outline them. I used my walking foot with white thread for all the quilting. White thread seemed like the best choice for this quilt. Using the walking foot was the best choice for me because my arthritic hands make free motion quilting more punishment than I want to deal with. This is the back of the quilt. After using some of the pink fabric on the front for the corner pinwheels and the frame around the center square, I came up just short of having enough for a whole cloth back. I had cut too many fabric squares for all the other pinwheels so that worked out well for pinwheels on either side of a large fabric square on the back. I was able to cut a piece with some of the words that were too large to get for the pieces on the front. 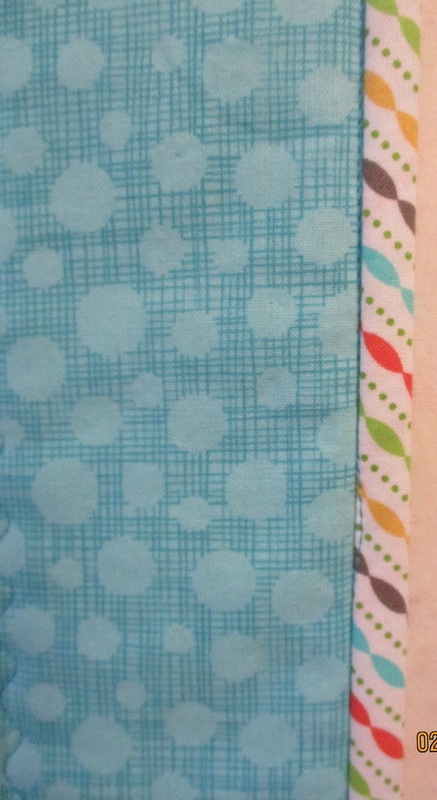 This is a closeup of the pieced strip on the pack. I was able to get one square with all of the words and images in the fabric. I am sometimes a little cautious about using colored quilting thread when I have a pieced back. This was one of those times and I think white was the right choice. I usually prefer more vibrant colors for my quilts and I wasn't so sure I would like this pale pink. I wasn't sure about using the light blue Grunge for the background in the pinwheels, White or Kona Bone might have bee more contrast but I decided on the blue because of the blue background in the focus fabric. All in all, I think it turned out to be a rather sweet little quilt. Sometimes you miss the mark and wonder why you thought something was a good idea and why you wasted your time. I made these Sunday after I went out to get the red Kona cotton. As soon as I cut the red strips to go around the chicken squares I knew I was going down the wrong path. But I kept going and it didn't get any better. I thought the hanger wouldn't look right in the middle of the square so I added a triangle and thought "Oh it looks like a barn". I kept going and layered them with batting and quilted them and I added batting to the backing and layered everything right sides together and turned them right side out and finished them with more stitching around them. What was I thinking? 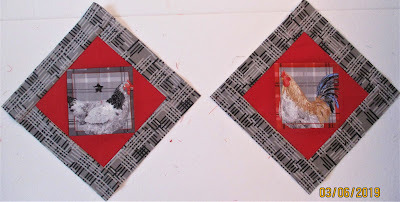 I decided that I didn't even like the rooster fabric all that much and I would scrap the potholder idea. I was going to cut the rest of the fabric into I spy squares and add them to the several stacks of I spy squares that are all different singles or pairs. So.... when I was cleaning up and putting boxes away I saw this black and gray plaid through the side of a clear plastic box. I've had his for a long time and I think I used it for backing. Once, in an attempt to rid myself of fabric I was never gong to use for a quilt I made some (ugly) reusable grocery shopping bags. I had some chicken squares already cut and I cut 4 1/4 inch red squares to cut on the diagonal and some strips of the black and gray plaid. That's a little better; I don't hate them. I will make pot holders with the rest of the squares I have already cut. I will use up all that black and gray plaid; that's a plus. I'm not sure why I thought this fabric would make great pot holders for my kitchen. The Squares are not printed square and they are small (5 inches) and close together. The chicken images are not crisp and distinct, they blend right into the background. The bright side is I don't hate the new design, I am using up the gray and black plaid, I needed the red Kona cotton anyway, I have some new additions to my I Spy packs and I can use some new pot holders and I will have some potholders to give away to people who like chickens. I also have a new resolve to resist buying fabric that is not something I need in order to finish something on which I am actually working. I mean it! Tuesday, I started on another box of leftovers and scraps and finished going through it Wednesday between loads of laundry. This was another box that I had somewhat sorted earlier. I made some good progress this time around. I stated with the box marked Parts Department (from Collaborative Quilts book by Gwen Marston and Freddy Moran). I found some things that should be combined with the same thing in other boxes. I ended up working with three boxes. I found zip lock bags with Laurel Burch leftover HST's and a zip lock with 4 1/2 inch Laurel Burch fabric squares and a sizable piece of fabric from which I had fussy cut squares for this quilt. This is from several years ago and was the last of a series of my original layout quilts using pictorial fabric and Birds in the Air blocks and this quilt also had some "North Wind" blocks. I loved the fabric I used and I had a lot of fun figuring out the on point setting and putting everything together. These below are some of the pieces I found Wednesday in different boxes. The HST's are 2 1/2 inches. There are some improv blocks, a bag of 4 1/2 inch squares, and that large piece with 3 jungle cats that someone gave me. I found pieces of the black dotty fabric and the fuchsia fabric as well as odds and ends of partial blocks. Now that they are all together in one place I see that I have enough there to make something. I am looking forward to making something. I found even more Laurel Burch cat fabric Thursday when I looked for something else. I am pretty happy about all of the Laurel Burch fabric I found. I stuck this panel up on the wall over the yellow and orange blocks and I remember doing this another time. I have something in mind to make using the panel and orange,yellow, blue and green. It will be small and I think it will be soon. I came across a lot of good things that I can use, zip lock bags with twenty or more of the same or coordinating fabric some are HST's, some are 4 patches both kinds are a variety of sizes. There are also filler or border strips of small blocks in usable sizes, and there is even a lightning bolt strip. Almost everything is put away now in a way that will be easy to find and use. Next I might tackle the HST box. After that I think I will actually work on one of the projects the has piqued my interest. 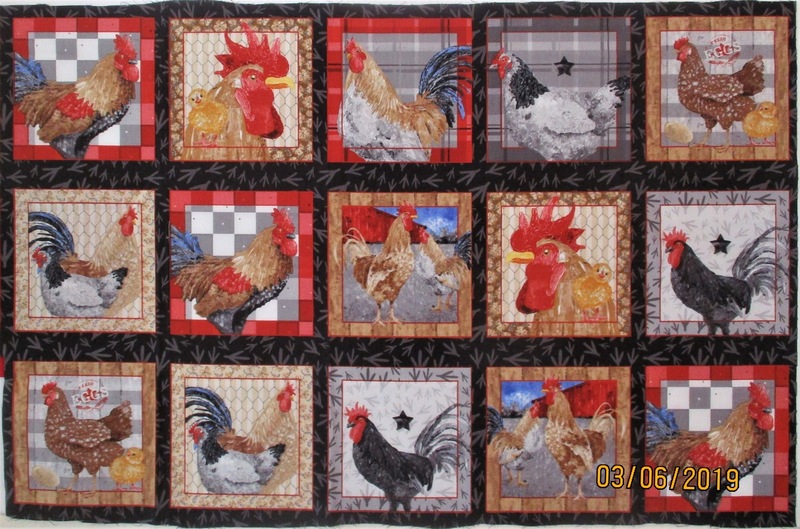 I went to the Farmpark Quilt show today and it is vendors weekend. I told myself I could not buy anything unless it is something I need to finish something from one of the things I found these past few days. Well...... I have never liked being told what I can't do. I bought 2 pieces of fabric but I can justify my purchase because I planned to come right home and make potholders with some chicken fabric. I have some metal roosters above my kitchen doorway and I wanted some chicken potholders. I haven't started them yet,,,,,,, but maybe Monday. 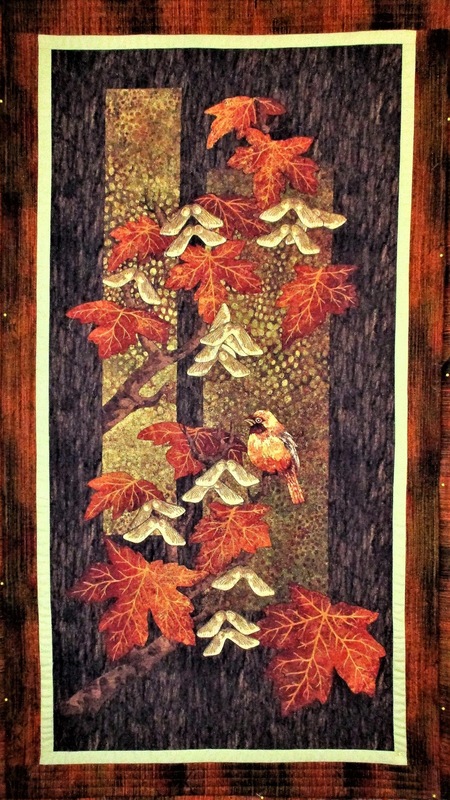 The Farmpark quilt show was very nice. The Best of Show was a wonderful quilt with amazing workman ship. The quilter's statement said it was a ten year project. 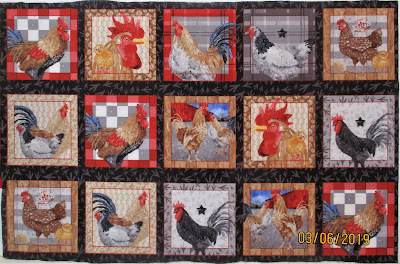 Click here to see small sample of the quilts, including Best of Show. Due to high wind advisories yesterday we stayed in all day. That gave me time to get back to my project of cleaning up/organizing/getting rid of my overwhelming collection of scraps. After I put away the Christmas things, I had them all out and all over every flat surface in my sewing room. I just could not stay focused; I ended up sorting things in some vague sort of organization and putting it all away. Today I pulled out one storage cube to work on. I decided that I would do some sewing and trimming and discarding, whatever it took to make some progress and some sense out of all the stuff in that cube. These are some larger pieces of "made fabric" from which I have already cut, and used, some 4 1/2 inch or slightly larger blocks. I folded these and set them aside in a zip lock bag. I will probably keep adding on to them for cutting smaller blocks. This is a pile of smaller pieces that are "made fabric" starter or in progress blocks. These are some of the blocks from that pile. I trimmed the edges so they are straight and ready to have additions on any side. I set these aside in zip lock bags as well. Most likely, these will be trimmed when they are close to the size I want to use for something. A few of them may grow to be bigger pieces to cut into several blocks. Most of these 8 1/2 inch blocks look like yellow blocks even though here are small amounts of other colors. Most of them were finished and trimmed to size. The 4 blocks on the left in the top row were incomplete and I decided that I would finish them. They asked me for orange strips and I obliged. It was after I finished them and put them on my design wall that I saw that they were orange and the other blocks were yellow. I had formerly thought of them all as "citrus". These are still on my design wall and I am thinking about what I want to do with them and what I will need to make to go with them. Everything else is put away again in the storage cube. It is sorted in away that I know I can work with. There is one bag that didn't make it back to the cube. For now it will go into the laundry basket under my cutting table "to be addressed". I still have a long way to go in order to make my space more workable. I have one project that is near completion but has been set on hold until I can decide on borders and backing; it is a need to finish project with a deadline. Only things that are needed will be worked on for the time being, All large goals are being put off or abandoned. I need to make changes in my sewing room that will result in not having to move furniture in order accomplish ordinary tasks, like cutting and pressing. I need to have most of my supplies where I can reach them without standing on a ladder or digging them out of a closet in another room. or even a guest room or TV room. My sewing space got cleaned up enough to work in it. I had to do something in order to finish this quilt but I am not really satisfied with it. I got so discouraged that I put everything away with only a little reorganization. 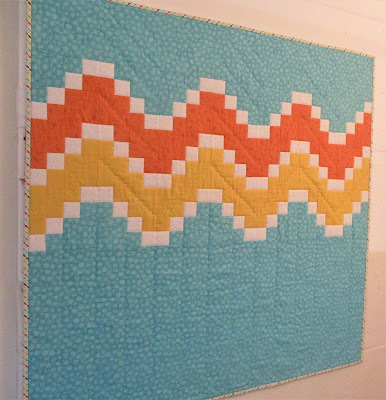 This is my first finished quilt for 2019. I had been waiting to get out and buy the binding and I finally went shopping last Friday. I was sure I would find what I wanted at the quilt shop but I didn't. I bought something anyway but by the time I got to my car I was having second thoughts. I stopped at Joann's on the way home and found something but by the time I got home I wondered if I might have something better in my stash, and I did. I didn't consider it before I shopped because I had something specific in mind. This is a closeup of the binding on the front of the quilt. I had stitched it on the font and turned it to the back and fused it down and then stitched by machine in the ditch on the front. This is a corner on the back. The binding is a little wider in some spots, probably because my seam allowance was a bit narrower in places. However, it is all stitched down and it isn't going anywhere. These are two shots of the whole 42 inches square quilt. I shot the photo below from the side to show up the quilting a little better. The color in this one is a little more true; it really isa little more turquoise . Now I need to give some serious thought to what I can do to make my space more user friendly. I am not ready yet to give up on quilting but I find myself doing less and less. Well, I wasn't quilt back to normal, at least I hope this is not the new normal for me. After I put all the Christmas things away, I decided to work on some organization in my sewing room and it has been increasingly chaotic. My scraps and leftover blocks and block components are simply out of control. I keep trying to make order out of chaos and there is just too much of too many things that don't really make any sense to keep. I will not show any photos or go into detail but it borders on lunacy, yes really! I am shelving ALL plans and goals until I am out from under the burden of all the "stuff". That doesn't mean I am not going to do any sewing but I am keeping it simple and limited to whatever needs to be done NOW. So..... the first thing was to catch up on blocks for the Friendship group. I got these two sets done yesterday and this morning. In the middle of all the mess it wasn't easy or fun but it was satisfying. I hope I will be caught up, I missed some meetings so I am not sure. The request for these 8 inch variable star blocks was for colorful fun fabrics with pieced centers. I think I hit the mark on the one on the right. I might have used a center with too many colors for the one on the left. The "candy cane" are also 8 inch blocks. These were easy to do once I found suitable fabrics in the mess I had created with my "organizing. 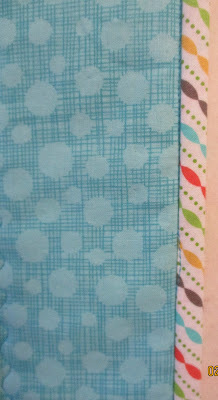 I need to get out and buy something for binding for the heartbeat quilt. Then I can get started (or finished) with making my sewing space workable again. Maybe "normal" isn't exactly right, maybe we are just back to every day life. Finally all of the Christmas things are put away; I found 2 more things yesterday that were out in plain sight but got missed. This year I did not get all my snowmen out for January, I just didn't want to go through all the trouble of putting them away again. Everything takes me much longer to accomplish than it used to and that dampens my enthusiasm. This weekend we had our first big snowstorm and we planned ahead so we would not need to go out until it was over. I read a lot, cooked a lot, cleaned up the kitchen a lot, and sewed a little. I started quilting the "heartbeat" quilt and ran out of the one color thread I need to finish. 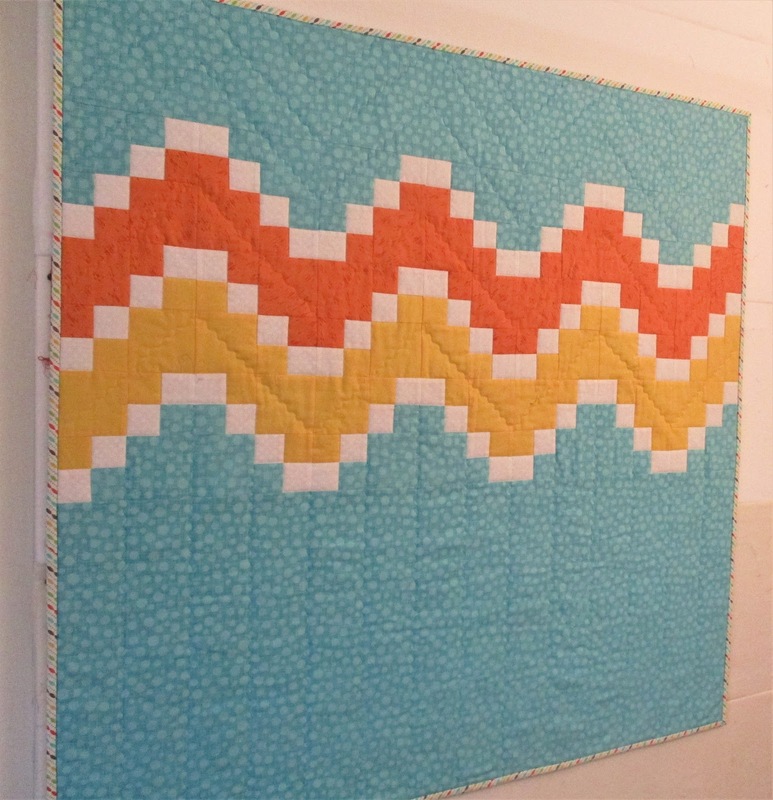 This little quilt measures about 42 inches square. I decided to use the colorful children's print on the back only and went with the subtle dotted blue/green on the rest of the top. I really wanted a "whole cloth" backing even though the fabric is only about an inch wider than the top. I am always into overkill with pin basting so I took the chance that it would work out OK. I can see that it will. I quilted in the ditch to outline all of the white chains. 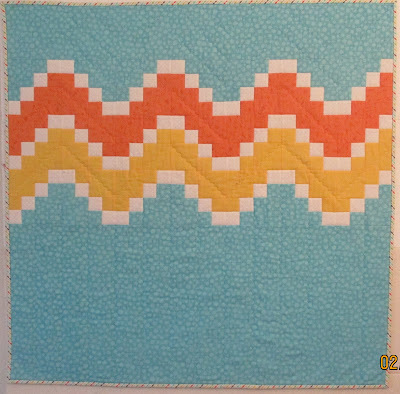 I used the running zigzag (Bernina no. 4) across the diagonal of the larger squares. Sometimes the curves in this stitch get either bunched up or stretched out if there is too much drag on the quilt moving it through the machine. This is not perfect but it looks pretty good. I am not going to rip anything out as I did in the last baby quilt from this pattern. I used thread to match the yellow, white and orange on the front and I matched the blue green on the back in the bobbin. I thought I would have enough of the blue/green to use on the top and in the bobbin for the rest of the quilting but I am pretty sure I will run out. I am waiting to get started on that until I can get out to buy some thread. After I finish this I have some small must do projects and I am thinking over my 2019 goals. I need to organize my plans and gather what I need. Maybe I need to pare down my goals to what is compatible with my slower reality. 2018 was not a super productive year but I am surprised there were more more finishes that I remembered. These first 2 are the first ones I finished in 2018 they were for a new great grandson who was due the end of January but arrived in early November. He is doing well now. The rest are not in the order in which they were finished. They are pretty much the way they uploaded and I am taking it as it is. This is one last piece that I finished yesterday. My DIL wanted a Christmas topper for a small chest. I had a lot of srips from a few years ago when our group at church made string pieced Christmas stockings. I stitched strips of various widths to a rectangle of Warm and Natural batting and added a backing and turned it pillow case style and stitched 1/2 inch around the outside. So that's it for 2018. I hope for everyone that 2019 will be a good year. A sad goodbye to the best cat I ever had. Lucy came to us June 2016 when my daughter found her in the state park where she walked every day. After a week of seeing her every day she brought her home. From the first day she was special to us. She was so calm and so friendly that she endeared herself to all of us. After my daughter took her to the vet we found out she had feline leukemia. The vet repeated the test as she appeared healthy but the results were the same. He said we could put her down right then or wait and see how she did. It was unanimous that we would wait and see. She was so active and full of life and so much fun that it was easy to forget that she wouldn't live to a ripe old age. She was a bright spot in my days. She hung out with me in my sewing room and when we watched TV. She never once sat on my lap but she sat next to me or on my desk or cutting table or sewing machine. She slept in our bedroom on top of Jack's dresser but when I didn't feel well she curled up next to me on the bed. She inspected and tested every quilt. She liked to guard the quilt pieces. When we moved from our daughters house to a first floor apartment, we didn't take Lucy with us. I missed her but I didn't have the heart to take her away from her big house and yard full of trees and birds and chipmunks. She was supposed to be a house cat but once she got outside there was no way to keep that fast kitty from getting out again. Three weeks ago when I asked how she was and my daughter said she was healthy and contented and the queen of the yard. One week later she started to eat less and less and last Wednesday she died quietly. I have loved every cat I ever had but Lucy was the sweetest cat and the most fun. I didn't do much sewing for Christmas this year. 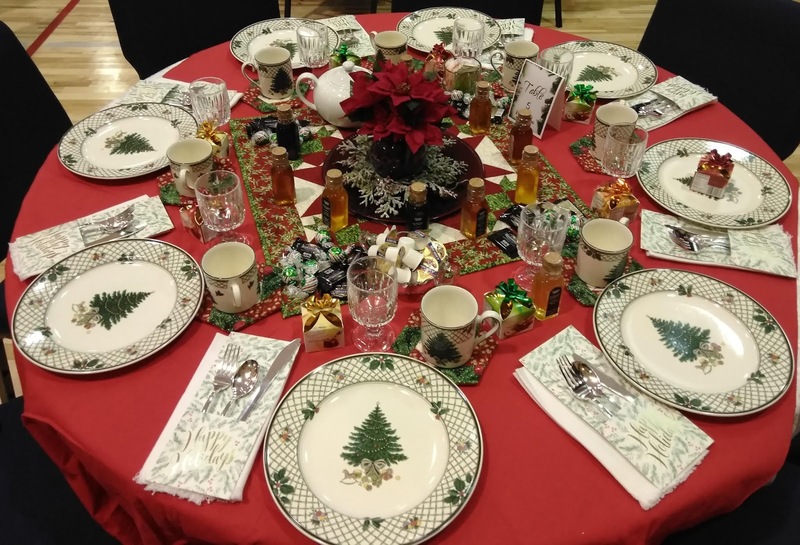 I made hexagon potholders for the boutique at our church's Christmas luncheon and some hex mug mats to decorated the table that my daughter in law and I decorated for the luncheon. We used my Christmas dishes and one of my quilted table toppers from 2 years ago and the 8 mug mats I made because 4 of my cups were mugs and didn't have saucers. My DIL had a red tablecloth and a set of goblets. This is always a nice event and different people decorate their tables for 8. I think our table looked nice enough but some of the tables were really really beautiful. I wish I had photos of all of them but I have only the one that my DIL took with her phone of our table. We went shopping one day for things we needed and found the little boxes of candy and small sample bottles of different kinds of honey. we gave the candy, honey and mug mats as favors to our table guests. This is how my table topper and center piece look on my table a home. My poinsettias probably need to be rearranged a little after their trip back home after the luncheon. This is where the Christmas dishes spend their time until New Years. I don't have them all out anymore. I keep the ones I use everyday in a more convenient place for setting the table and just leave these in the hutch, unless I need more than 4 place settings. All the other things on the hutch shelves are things that have some meaning to me and I like to think about the people who gave them to me when I get them out every year. So the dishes are out and so are all the rest of the Christmas things. I will save the rest for another post. When I went on a 2 quilt shop road trip a couple of weeks ago, I bought 2 apron panels. This is one of them. It is all printed along with the instructions on one yard. The colors show up better here. I had to take shep photos without the flash and the green against the gold is a bit off. The neck strap and and applique motifs to put on the lining on the reverse side . The other apron panel is hiding, it was right on my table yesterday; maybe it is camera shy. It is the same except for the colors it has blue instead of green and some other differences. I am going to line the both with yellow, maybe a solid or print that reads like a solid.